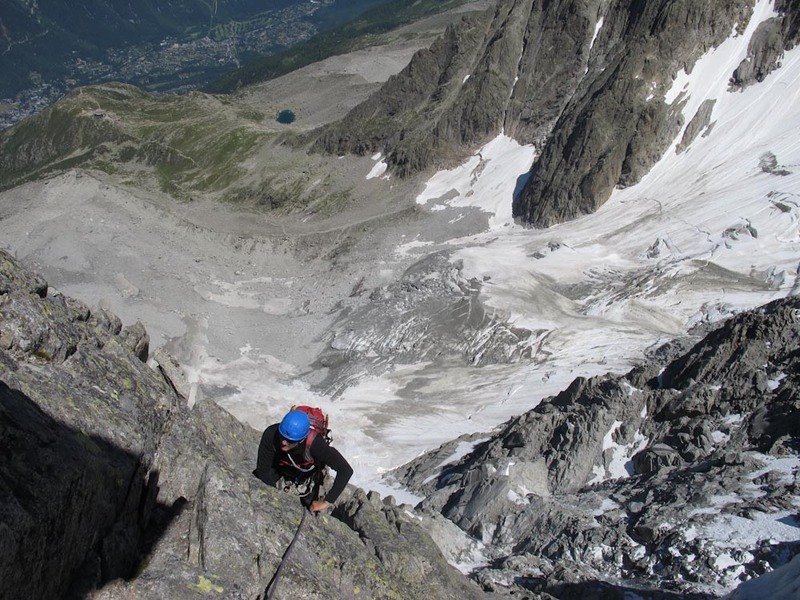 Looking up from Chamonix to the Aiguille du Midi, Vadim asks, “Is there a route up there we can do together Hans?” Of course I immediately thought about the Frendo Spur, number 62 in the “100 best of” by Gaston Rébuffat. 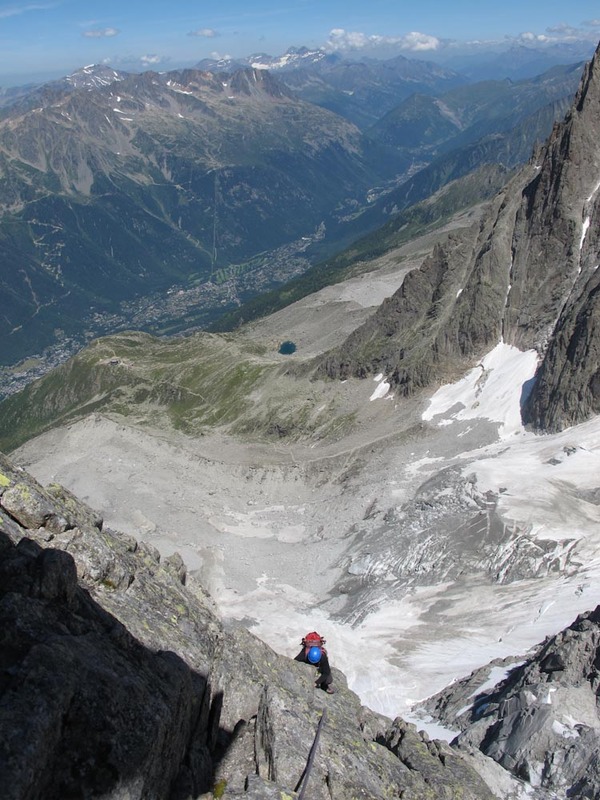 Anyone out there collecting points from this classic guide to the Mont Blanc Group? Without even looking at it beforehand, I realized we did 3 this week- 23, 42, and 62! 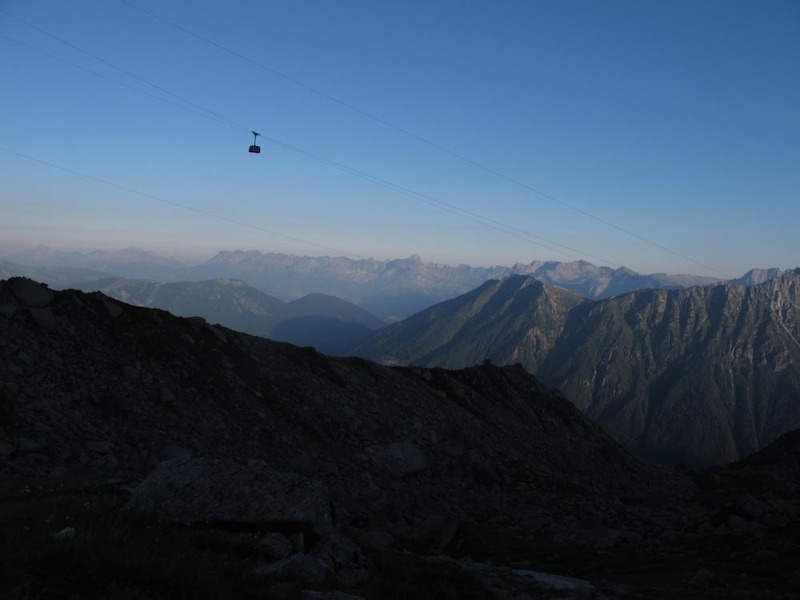 We took the second lift of the morning from Chamonix, arriving at the mid station of Plan de l’Aiguille at 7AM. From here, it’s about 45 minutes to the base of the route. The neve steepens, and one wants to traverse right to stay out of the line of fire from the seracs above, to the left of the Frendo spur. There was still good, hard snow on the two initial ramps, allowing us rapid progress up. 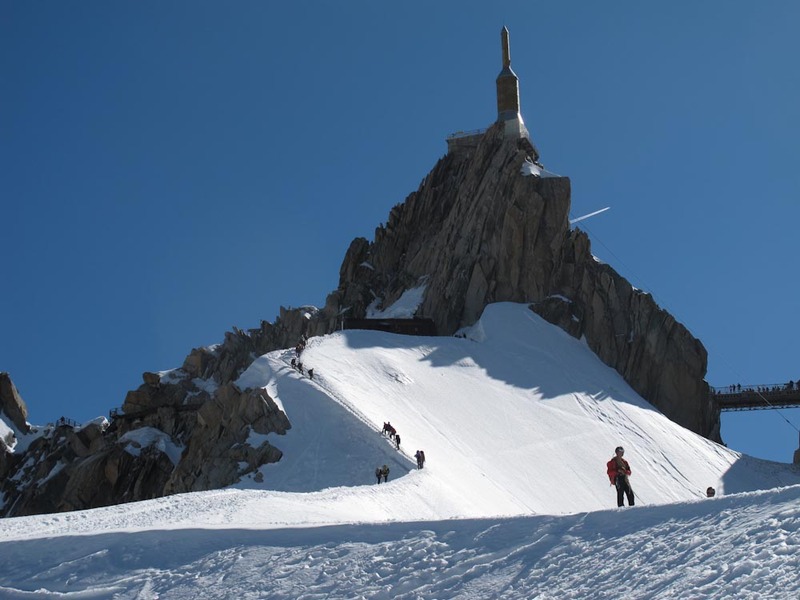 At some point, as the second ramp steepens, one goes right, up some steep blocks and chimneys over something called the râteau de chévre. I never did find it, instead settling on the excellent Hawaiian Variant. A couple of moves on hands and knees near the end of this fine variant, and we were in the sun on the other side of the spur. 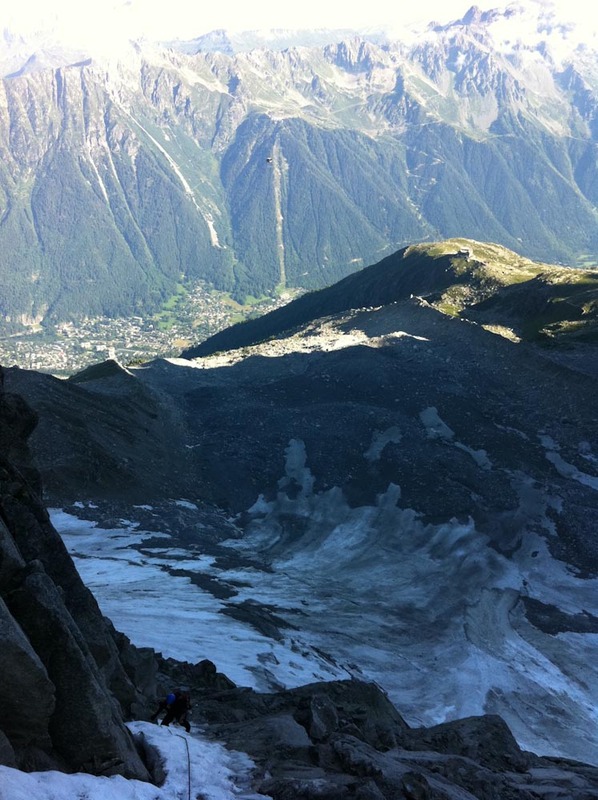 From here, we climbed quickly together on super mellow terrain. It was fun to scramble rapidly up, gaining lots of height with each step. 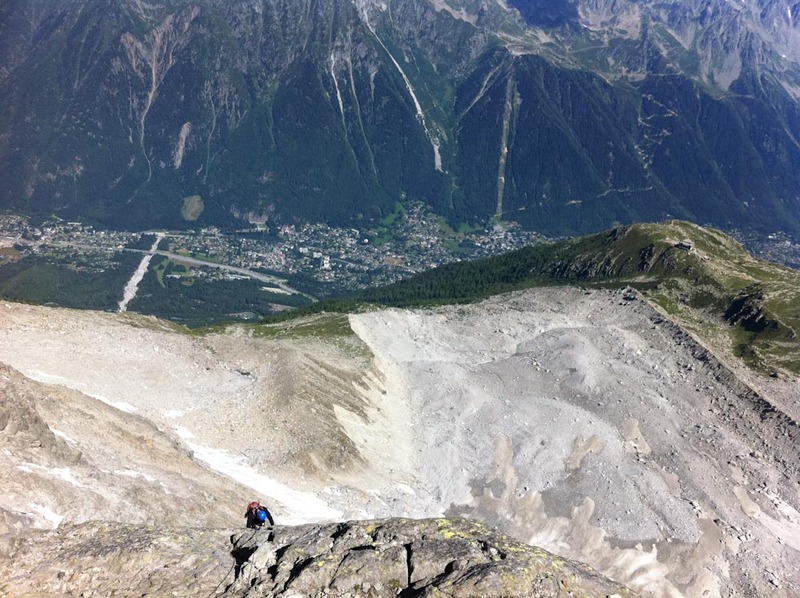 When the rock steepend, we scooted left again and found more good scrambling and a few nice moves of 3+ – 4. 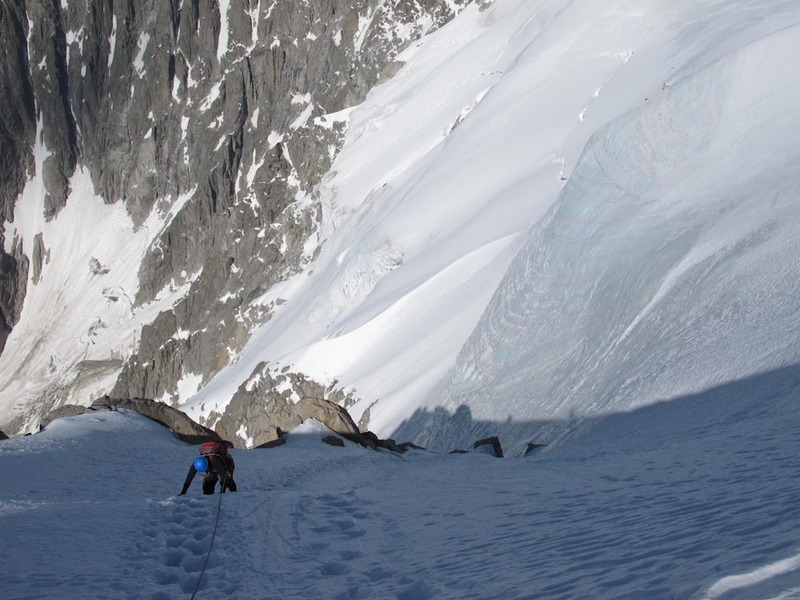 The key passage at the tiny col was a quite obvious dihedral blocked by a little overhang on its left. Three pitons allowed us to French Free this is fine style. Then we pitched out 4-6 rope lengths on super nice rock. A super hard aid move to get over a silly block, of which no guide book ever mentioned, got us on a line to get around even further left and within view of the final snow and ice pitches. Putting crampons on again, we climbed together up the steep knife ridge. 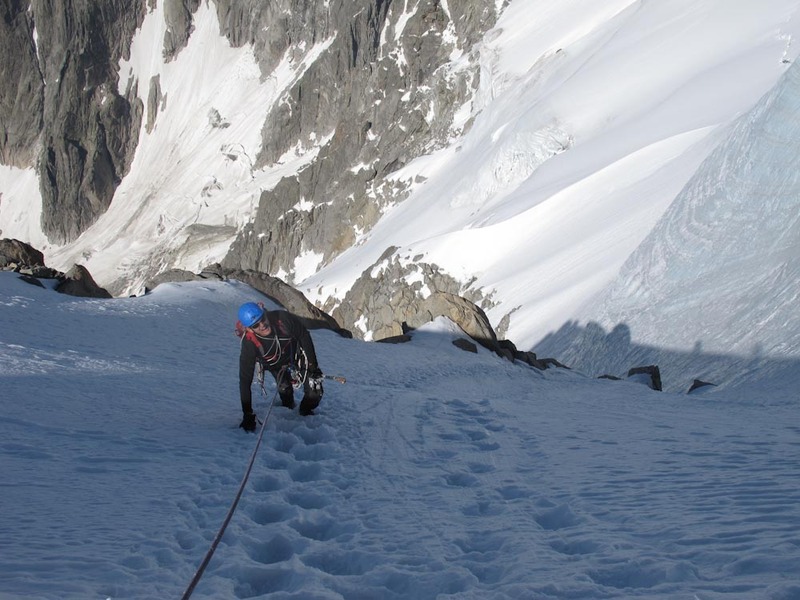 As it steepened and the ice became more apparent under the snow, I slapped in a screw and started running out pitches again. The ice was superb! It felt like the finest icy desert to an already fine meal of rock. My Nomics were happy to sink their teeth into some alpine ice after months sleeping under Anya’s bed. We stepped over the top, into another world. 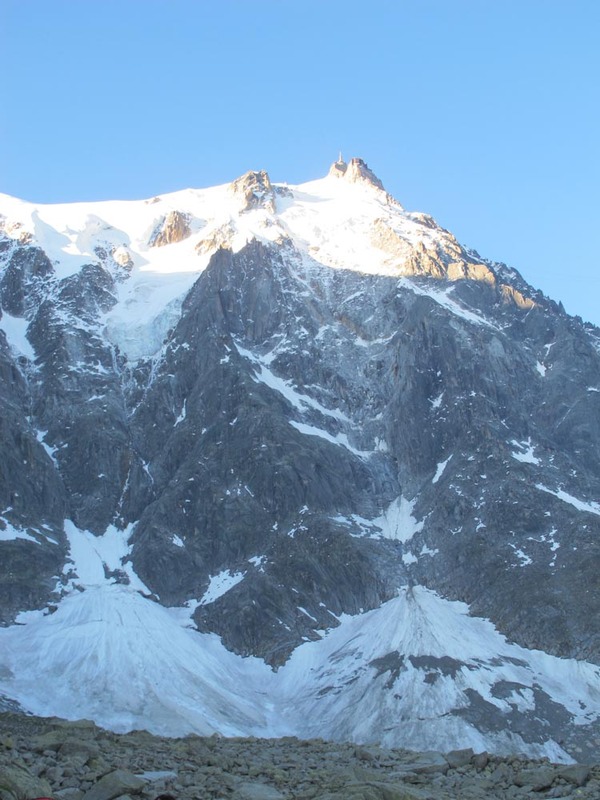 Climbers all over the place, heading up to the Midi lift, heading down to the Cosmique hut, people talking, carabiners clinking, full-on sun… and the lift to take us back down to Chamonix for beer and a Chinese meal! And all this just to save on the lift pass from the mid-station to the top!!! 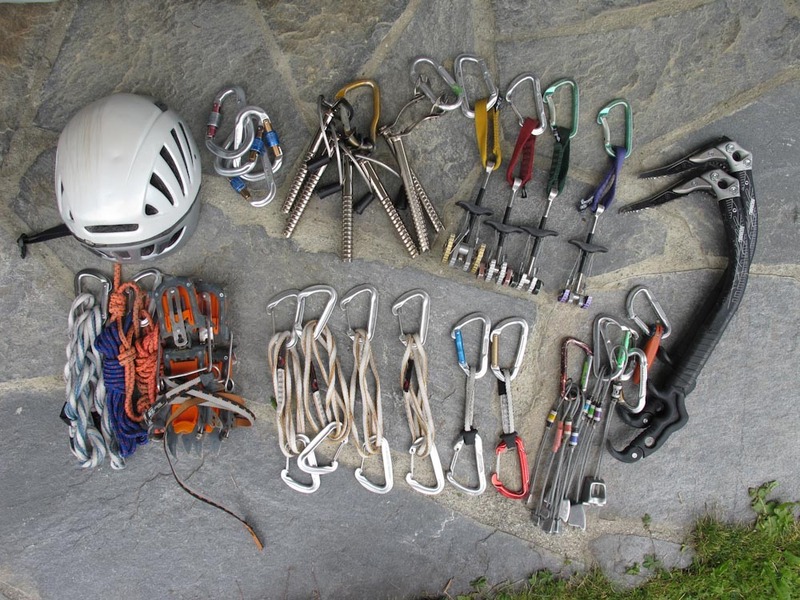 This entry was posted in Alpine Climbing and tagged Alpine Climbing on July 9, 2011 by Hans Solmssen. 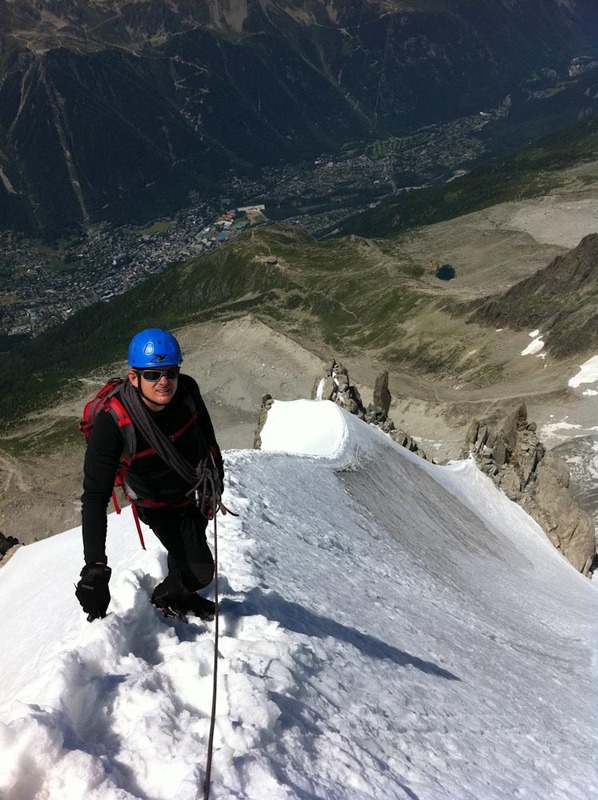 I am a professional mountain guide living in Verbier, Switzerland. I grew up on the Big Island of Hawaii after my father moved to Hawaii to teach at Hawaii Preparatory Academy. He created a horse program at this high school, located in the middle of the largest, privately owned cattle ranch in the US. Horses were a major part of my life, even playing polo for a few years. I moved to northern Vermont to go to school, and discovered skiing. Little did I know, this would become my life's passion: guiding friends and clients over the mountains around the world on skis and foot. 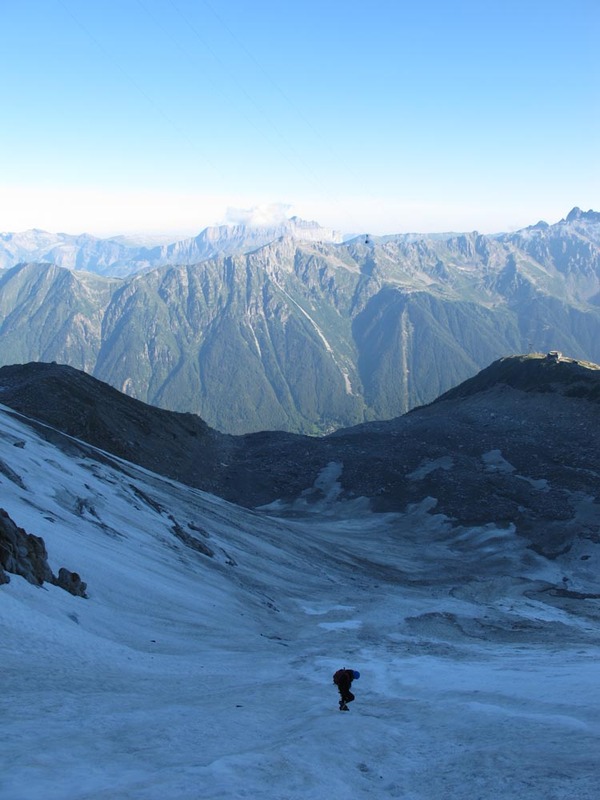 I moved to Verbier, Switzerland in 1982, and entered the Swiss guide's program in '88. I received my UIAGM "pin" 3 years later in 1991. I have two kids, Anya and Kevin.